Retaining skeletal muscle mass whilst concurrently reducing body fat has been a popular approach to improve body-composition among individuals in the fitness community for aesthetic and competitive reasons, and members of the general population for health and wellbeing. Bodybuilders and other physique competitors in particular strive to implement training and nutrition methods that ensure a very lean and muscular physique is attained during competition/contest preparation. This process of improving body composition – reducing body fat (BF) and retaining or gaining skeletal muscle mass – involves several components, some better investigated than others. It is well established in the literature that energy restriction, high dietary protein intake (relative to individual fat-free mass) and resistance training are the three main components essential to optimize concurrent BF loss and skeletal muscle preservation. The laws of thermodynamics demonstrate that energy balance must be negative for significant body weight loss to occur (Hall et al., 2011), this emphasises energy restriction as the most effect means to inducing fat loss. Energy restriction alone (absence of resistance training) has been shown in a systematic review to result in 20-30% of total body mass lost as lean body mass (LBM; predominantly muscle mass) with the remaining mass lost from adipose tissue (Weinheimer-Haus et al., 2010). This highlights the importance of resistance training for bodybuilders who want to improve or maintain muscle mass during energy restriction induced fat loss. This review was based on numerous weight loss studies with varying degrees of energy restriction and highlights the importance of resistance training for individuals who want to improve their body composition. The magnitude of the energy deficit imposed is also one of the key variables that impacts skeletal muscle loss. Mettler et al (2009) and Mourier et al (1997) found that fast rates of weight loss in athletes with low body fat often results in muscle mass loss. Mechanistic explanations for this are that leaner individuals derive two-to-threefold more energy from protein, display twice as much urinary nitrogen excretion, and show greater amounts of leucine oxidation than subjects with a higher body fat percentage (Elia et al., 1999). Additionally, leaner individuals are also more susceptible to decrements in training performance when an energy deficit is present (Buford et al., 2006), increasing their chances of losing muscle mass. This demonstrates that along with the magnitude of the energy deficit, the availability of stored body fat also impacts the extent of changes in muscle tissue. Although a small deficit for the entire diet would likely yield maximal retention, there are other practical and timely factors to consider. A small deficit will result in a prolonged dieting period and excessive diet fatigue that can takes its toll on the human body, physiologically and psychologically. A sustained small deficit also comes with an increased chance of motivation related drop offs due to the possibility of in-consistent and hardly noticeable changes in body weight. At the start of a fat loss phase, individuals generally present with a higher degree of motivation, and hunger/fullness regulating hormones are at baseline (Weigle et al., 2003), making it an optimal time to undergo a larger deficit. Gibson et al (2017) found that an initially larger deficit has a positive impact on adherence due to increased motivation and can increase the individual’s chances of long-term weight loss success (Nackers et al., 2010). Along with these positive sustainability factors, an initially larger deficit will also reduce the total time spent dieting due to the faster rate of weight loss. For overweight individuals and leaner individuals who are >10% body fat for males and >19% body fat for females, an initially larger deficit that decreases in size along with decreases in body fat may be superior than a small deficit. These individuals also have more body fat to liberate and a decreased chance of facing performance decrements in the initial stages of a fat loss phase even in the presence of carbohydrate restriction (Sawyer et al., 2013), thus increasing their chances of retaining muscle mass. On the other hand, it is recommended that leaner individuals (<10% males and <19% females) adopt a smaller deficit and reduce their rate of weight loss to negate significant muscle loss. For this population it is recommended that weight loss rates do not significantly surpass 0.5kg per week or 0.7% of total body mass to protect against the loss of muscle tissue (Helms et al., 2013). Overall, significant fat loss can only be induced with energy restriction leading to negative energy balance, thus making it an unavoidable component of body composition improvement. Myogenic remodelling, whether it be growth or degradation, is at least in part determined by the rate of protein turnover. Positive protein is comprised of protein synthesis and degradation/breakdown; positive muscle protein turnover (net protein balance), culminates from a rate of muscle protein synthesis (MPS) chronically exceeding the rate of muscle protein breakdown (MPB). This ultimately results in the accretion of contractile proteins within skeletal muscle cells, contributing to an increase in cross-sectional area and muscle hypertrophy. A five-day moderate energy deficit has been shown to result in a 27% reduction in resting rates of myofibrillar protein synthesis (Areta et al., 2014) along with an altered magnitude of translation initiation signalling in response to an acute bout of resistance training. This reduction in MPS during energy restriction may be an adaptive response, since the construction of new myofibrillar proteins is an energy expensive process (Areta et al., 2014). This adaptive response also demonstrates an increased efficiency for protein metabolism due to the limited supply of energy – less energy consumption (semi-starvation) results in an increased need to use protein for functionality instead of skeletal muscle growth (Helms et al., 2013). For these reasons, anything that meaningfully alters the protein turnover ratio such as high protein consumption is of utmost importance in an energy restricted state if the goal is to optimize LBM retention. Longland et al (2016) found that individuals who consumed a high protein intake of 2.4g/kg of bodyweight gained more LBM (1.2 ± 1.0 kg) than individuals who consumed a low protein intake of 1.2g/kg (0.1 ± 1.0 kg) in a 4-week study that involved resistance training. There is a large body of evidence showing the benefits of high protein intake on LBM retention. Helms et al (2013) conducted a meta-analysis consisting of studies that involved resistance trained males and females with a healthy body fat. Helms concluded that protein intake to maximise LBM retention in an energy restricted state should be 2.3-3.1g/kg of fat free mass (FFM) due to the large amount of energy being derived from protein for leaner individuals. Another meta-analysis by Morton et al (2017) found that 1.6g protein/kg/day was sufficient enough to optimise resistance training induced changes in muscle mass and 1RM strength in individuals who were not energy restricted. This discrepancy in protein recommendations highlights the importance of a higher protein intake in an energy restricted state. Even though a high protein intake has a substantial effect on MPS, without a resistance training stimulus, the chances of retaining muscle in an energy restricted state will be severely supressed. Mechanical tension is what causes disruption in contractile protein homeostasis that is followed by an exponential rise in MPS and a growth response in skeletal muscle. Without resistance training, significant muscle growth or maximal muscle preservation will not occur. Areta et al (2014) found that mechanical tension placed on skeletal muscle attenuated the energy related reductions in MPS by restoring MPS to values observed at rest in a state of energy balance. This study also found that protein ingestion after resistance training further increases levels of MPS above those observed at rest in energy balance. This combination acts synergistically on MPS causing it to rise exponentially higher than resistance training alone or protein ingestion alone (Longland et al., 2016). Resistance training also starts a chemical signalling cascade that occurs when mechanical signals are transduced via mechanoreceptors leading to an elevation in anabolic signalling that may counteract the energy related decline in anabolic hormones (Helms et al., 2013). Without a doubt, consistent resistance training is the most critical factor for LBM retention in an energy restricted state – specifically, mechanical tension that induces a sufficient training stress. Without this training stress and subsequent muscle preserving signals, the human body will be left with a declining need to send protein and energy to skeletal muscle – rather, it will derive protein and energy from skeletal muscle. The fact that resistance training needs to be performed for an improvement in body composition is widely understood by the fitness community and definitely approved by the literature. However, there is a considerable lack of research when it comes to identifying the most effective resistance training prescription in an energy restricted state. There are generally two different approaches that are undertaken by recreational exercisers and bodybuilders when the goal is to lose BF and retain muscle mass; 1) a low rep-high load approach with the goal of maintaining or increasing strength, or 2) a high-volume approach with the goal of maintaining or increasing volume (volume = sets x reps). A recent case report and critical review by Gentil et al (2017) found that bodybuilders (both male and female) generally performed sets of 8-12 repetitions with 2-3-minute rest in their weight gain phase and sets of 12-15 repetitions with 45-60 second rest in their weight loss phase. 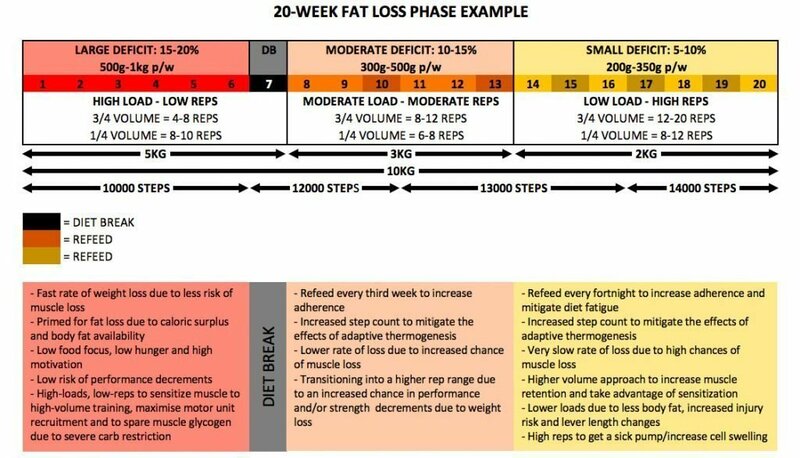 It is very common for bodybuilders to cycle through rep ranges in their weight gain and weight loss phases. Another study supports this claim (Hackett et al., 2013) by finding that a majority of subjects (bodybuilders) increased their repetitions performed to 10-15 in their pre-competition phase from 7-9 in their off-season. Bodybuilders are known to get very lean in the latter stages of their pre-competition phase and this is accompanied with a reduction in strength, joint stability and an increasing injury risk – this may be why bodybuilders choose to train with lower loads and higher reps during this period. These studies indicate that bodybuilders cycle rep ranges during weight gain and weight loss phases, and that most bodybuilders already train with a very high amount of training volume (training volume = sets x reps) in both off-season and pre-competition phases to maximise skeletal muscle growth. The literature does support the use of higher training volumes to induce greater muscle hypertrophy – Schoenfeld et al (2018) found that a higher training volume was associated with greater increases in markers of muscle hypertrophy in those with previous resistance training experience. However, subjects in this study were told to continue on with their current nutritional regimen and were not prescribed either a hypocaloric or hypercaloric diet, making these findings less applicable to individuals who are undoubtedly energy restricted. Another study found that high volume exercise stimulated more protein synthesis than low volume-high intensity exercise, however differences were marginal and this was not a properly structured training study (Burd et al., 2010). Since high-volume training stimulates a great hypertrophic response at energy balance or surplus, it is logical to presume that even higher training volumes will increase the muscle preservation effect in an energy restricted state. However, there is no evidence that supports this claim and it is unclear whether maximally stimulating growth via high volume training is the best way to counteract breakdown in an energy restricted state. Aiming for a greater total training volume in an energy restricted state may actually be problematic due to the large amount of psychological and physiological fatigue that sustained energy restriction induces. Even if protein intake is kept high, restriction of energy can lead to a reduction in anabolic signalling hormones, particularly IGF-1 and testosterone (Henning et al., 2014). In a 12-month case study on bodybuilders, Rossow et al (2013) found that a 10kg drop in body mass resulted in testosterone levels declining by 75% (9.22 to 2.25 ng/mL). Testosterone has a direct effect on muscle protein synthesis stimulation (Griggs et al., 1989) and can potentiate skeletal muscle growth – a reduction in testosterone will decrease the body’s ability to synthesise proteins and adapt to the resistance training stimulus. Henning et al (2014) found that testosterone reductions were dependent on the severity of the energy deficit, making it potentially favourable to reduce the size of the deficit when an individual is lean and has an increased risk of skeletal muscle loss. Hormone down-regulation due to energy restriction can culminate to a reduction in the human body’s ability to recover or even benefit from certain amounts of training volume. The point at which training volume may become detrimental (in energy restriction) is unknown, however, it may be better to take a conservative approach and limit the excess generation of fatigue. Contrary to popular belief that is generally held by bodybuilders, lower rep sets with higher absolute intensities still have the potential to induce muscle hypertrophy as demonstrated in training study on resistance trained men (Mangine et al., 2015). This is most likely due to the fact that mechanical loading itself is what induces a remodelling response in skeletal muscle, not a specific rep range. The limitation to this study was the fact it was conducted over a short-term period lasting 8-weeks – a longer training period may have produced different results in favour of high-volume training. However, this study should not be ignored because the short-term nature of fat loss phases increases its applicability. Along with mechanical loading, full motor unit recruitment also needs to be achieved to maximise hypertrophy and can be achieved with high rep ranges or lower rep ranges – as long as the intensity of effort is sufficient (Carpinelli, 2008). Henemens size principle demonstrates that progressively larger motor units (high threshold motor units) are recruited in response to increased demands (Carpinelli, 2008). Motor units that predominantly control type I fibres are generally recruited before the additional recruitment of higher threshold motor units that predominantly control type II fibres. Overall, as the intensity of effort rises throughout a set, so does the recruitment of high threshold motor units. Absolute intensity itself also directly increases motor unit recruitment (Yavuz & Erdag, 2017). Additionally, considering the fact that carbohydrate restriction impairs exercise performance and high-volume workouts rely predominantly on the anaerobic glycolytic system, lower volume-higher intensity workouts may help spare muscle glycogen and somewhat sustain the anabolic effects of glucose availability through mTOR (Sengupta, 2010). This type of training relies less on the anaerobic glycolytic system (Kraemer et al., 1990) and has even been found to promote greater improvements in skeletal muscle hypertrophy in resistance trained men during a short-term training period (Mangine et al., 2015). It may be advantageous for those who are in energy restriction – particularly individuals who are also performing cardio or individuals who are on a very low carbohydrate intake (50-60kg females) – to spare muscle glycogen via a low volume-high intensity training approach that spans 8-10 weeks. Robergs et al (1991) demonstrated that subjects performing a high-volume workout consisting of 6 sets of leg extensions at 35% and 70% of 1RM resulted in a decrease in muscle glycogen by 38% and 39%, respectively. This may not sound like a very large reduction in muscle glycogen, but pairing it with subsequent high-volume exercises and cardio will lead to glucose deprivation and mTOR downregulation (Sengupta, 2010). The glycolytic flux that occurs with glucose deprivation leads to lowered ATP levels and a subsequent increase in the AMP/ATP ratio, thus activating AMPK. Upregulation of AMPK will interfere with cell growth by directly inhibiting mTOR and its energy (ATP) consuming processes like translation initiation and protein synthesis (Sengupta, 2010). With this in mind, a hypothesis can be created: Lower rep ranges with higher absolute intensities and reduced total training volumes may be advantageous for muscle retention in an energy deficit in the short term. This may be due to a) sufficient mechanical loading/tension b) maximised motor unit recruitment c) total volume being within individual recovery capabilities d) less peripheral fatigue/glycogen sparing. Overall, both training approaches discussed (high volume and low-volume + high intensity) are viable ways of inducing mechanical tension that is sufficient enough to signal the human body to preserve lean tissue. However, the current literature on muscle retention in an energy deficit is extremely limited, making it difficult to provide an optimal prescription. There is a large gap in this area of research that would draw the attention of many coaches, bodybuilders and scientists from around the world. Also opening possibilities for future research that focuses on optimizing resistance training variables (volume, frequency, intensity) to enhance skeletal muscle retention during energy restriction. Hall, K. D., Sacks, G., Chandramohan, D., Chow, C. C., Wang, Y. C., Gortmaker, S. L., & Swinburn, B. A. (2011). Quantification of the effect of energy imbalance on bodyweight. Lancet (London, England), 378(9793), 826-37. Weinheimer-Haus, Eileen & Sands, Laura & W Campbell, Wayne. (2010). A systematic review of the separate and combined effects of energy restriction and exercise on fat-free mass in middle-aged and older adults: Implications for sarcopenic obesity. Nutrition reviews. 68. 375-88. Mettler, Samuel & Mitchell, Nigel & Tipton, Kevin. (2009). Increased Protein Intake Reduces Lean Body Mass Loss during Weight Loss in Athletes. 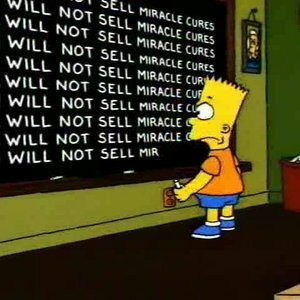 Medicine and science in sports and exercise. 42. 326-37. Mourier, A & Bigard, A.X. & de Kerviler, Eric & Roger, B & Legrand, H & Guezennec, Charles. (1997). Combined Effects of Caloric Restriction and Branched-Chain Amino Acid Supplementation on Body Composition and Exercise Performance in Elite Wrestlers. International journal of sports medicine. 18. 47-55. Buford, T.W., Rossi, S.J., Smith, D.B., O’Brien, M.S., & Picker- ing, C. (2006). The effect of a competitive wrestling season on body weight, hydration, and muscular performance in collegiate wrestlers. Journal of Strength and Conditioning Research, 20(3), 689–692. Helms, Eric & Zinn, Caryn & Rowlands, David & Brown, Scott. (2013). A Systematic Review of Dietary Protein During Caloric Restriction in Resistance Trained Lean Athletes: A Case for Higher Intakes. International journal of sport nutrition and exercise metabolism. 24. Areta, José & Burke, Louise & Camera, Donny & West, Daniel & Crawshay, Siobhan & Moore, Daniel & Stellingwerff, Trent & Phillips, Stuart & Hawley, John & Coffey, Vernon. (2014). Reduced resting skeletal muscle protein synthesis is rescued by resistance exercise and protein ingestion following short-term energy deficit. American journal of physiology. Endocrinology and metabolism. 306. Longland, Thomas & Oikawa, Sara & Mitchell, Cameron & Devries, Michaela & Phillips, Stuart. (2016). Higher compared with lower dietary protein during an energy deficit combined with intense exercise promotes greater lean mass gain and fat mass loss: A randomized trial. The American journal of clinical nutrition. 103. Gentil, Paulo & Lira, Claudio & Paoli, Antonio & Barbosa, Alexandre & Santos, Dos & Deivide, Roberto & Da Silva, Teixeira & Romulo Pereira, José & Pereira Da Silva, Edson & Ferro Magosso, Rodrigo. (2017). Nutrition, Pharmacological and Training Strategies Adopted by Six Bodybuilders: Case Report and Critical Review. European Journal of Translational Myology. 72. 51-66. Hackett, Daniel & Johnson, Nathan & Chow, Chin-Moi. (2012). Training Practices and Ergogenic Aids Used by Male Bodybuilders. Journal of strength and conditioning research / National Strength & Conditioning Association. 27. Schoenfeld, Brad & Contreras, Bret & Krieger, James & Grgic, Jozo & DelCastillo, Kenneth & Belliard, Ramon & Alto, Andrew. (2018). Resistance Training Volume Enhances Muscle Hypertrophy. Medicine and science in sports and exercise. Burd, N. A., West, D. W., Staples, A. W., Atherton, P. J., Baker, J. M., Moore, D. R., Holwerda, A. M., Parise, G., Rennie, M. J., Baker, S. K., … Phillips, S. M. (2010). Low-load high volume resistance exercise stimulates muscle protein synthesis more than high-load low volume resistance exercise in young men. Henning, Paul & Margolis, Lee & P. McClung, James & Young, Andrew & Pasiakos, Stefan. (2014). High protein diets do not attenuate decrements in testosterone and IGF-I during energy deficit. Metabolism. 63. C Griggs, R & Kingston, W & F Jozefowicz, R & E Herr, B & Forbes, G & Halliday, D. (1989). Effect of testosterone on muscle and muscle protein synthesis. Journal of applied physiology (Bethesda, Md. : 1985). 66. 498-503. Carpinelli, Ralph. (2008). The size principle and a critical analysis of the unsubstantiated heavier-is-better recommendation for resistance training. Journal of Exercise Science and Fitness. 6. Yavuz HU, Erdag D. Kinematic and Electromyographic Activity Changes during Back Squat with Submaximal and Maximal Loading. Appl Bionics Biomech. 2017:1-8. Sengupta, S., Peterson, T. R., & Sabatini, D. M. (2010). Regulation of the mTOR complex 1 pathway by nutrients, growth factors, and stress. Molecular cell, 40(2), 310-22. Kraemer, William & Marchitelli, L.J. & E Gordon, S & Harman, E & Dziados, Joe & Mello, R & Frykman, Peter & McCurry, D & J Fleck, S. (1990). Hormonal and growth factor responses to heavy resistance exercise protocols. Journal of applied physiology (Bethesda, Md. : 1985). 69. 1442-50. Robergs, Robert & Pearson, David & Costill, David & J Fink, W & Pascoe, David & Benedict, MA & P Lambert, C & J Zachweija, J. (1991). Muscle glycogenolysis during differing intensities of weight-resistance exercise. Journal of applied physiology (Bethesda, Md. : 1985). 70. 1700-6. S Weigle, David & Cummings, David & D Newby, Patricia & A Breen, Patricia & Scott Frayo, R & C Matthys, Colleen & Callahan, Holly & Q Purnell, Jonathan. (2003). Roles of Leptin and Ghrelin in the Loss of Body Weight Caused by a Low Fat, High Carbohydrate Diet. The Journal of clinical endocrinology and metabolism. 88. 1577-86. C Sawyer, Jason & J. Wood, Richard & W Davidson, Patrick & Collins, Sean & Matthews, Tracy & M Gregory, Sara & Paolone, Vincent. (2013). Effects of a Short-Term Carbohydrate-Restricted Diet on Strength and Power Performance. Journal of strength and conditioning research / National Strength & Conditioning Association. 27. Morton RW, Murphy KT, McKellar SR, et al. (2017). A systematic review, meta-analysis and meta-regression of the effect of protein supplementation on resistance training-induced gains in muscle mass and strength in healthy adults. Br J Sports Med 2018;52:376-384. Martin Refalo is a competitive bodybuilder and body composition coach at JPS Airport West. With a bachelor of exercise science and passion for knowing the in's and out's of fat loss and muscle gain, Martin is fast becoming one of Melbourne's leading physique coaches.